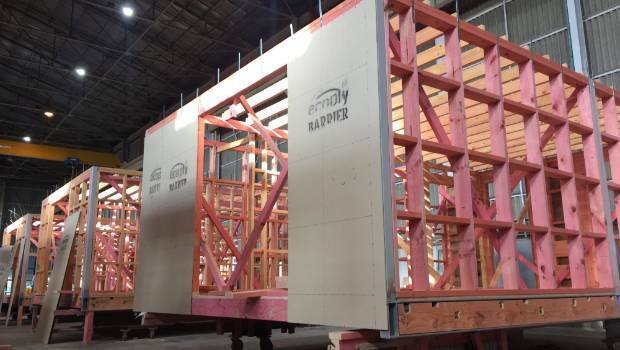 Fast construction times, modern design and the incorporation of energy efficient features could make prefabricated houses a key piece in the puzzle in closing the shortfall in New Zealand's housing stocks. 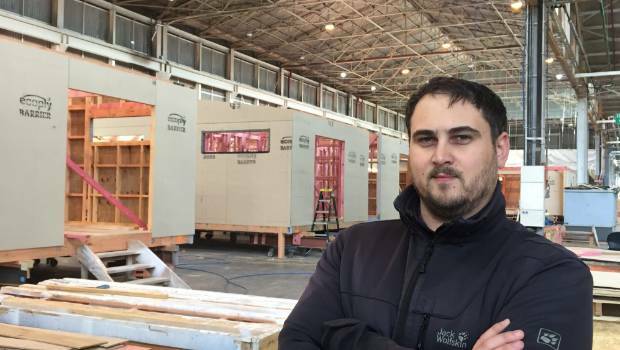 Matrix account manager Marcus Bokkerink says while the cost of materials for a prefabricated house is roughly the same as an on-site build, labour costs are lower because of the faster build times. For many Kiwis the word 'prefab' conjures up images of cold, ugly school classrooms - it's a perception which some in the building industry say is holding the country back. Heather Crilly, a member of the New Zealand Institute of Building Surveyors (NZIBS) executive, said New Zealand had been slow to recognise the value of prefabricated buildings which were constructed whole, in sections or as parts off-site. Matrix Homes builds about 10 new houses a month in their factory at the former General Motors plant in Upper Hutt. While only five to 10 per cent of newly built homes in New Zealand were prefabs that number in some parts of Europe was as high as 80 per cent. She said with an acute housing shortage across much of the country the obvious advantage of prefabrication techniques was the speed at which homes could be built. Prefabrication could also provide a better quality product because manufacturing was carried out indoors in controlled conditions. Modern insulation and other energy efficient techniques could also be applied to them. A greater variety of prefabricated products would become available as the market expanded and economy of scale could eventually bring prices down. There was also scope for New Zealand to import houses from places like Europe where the industry was well established. 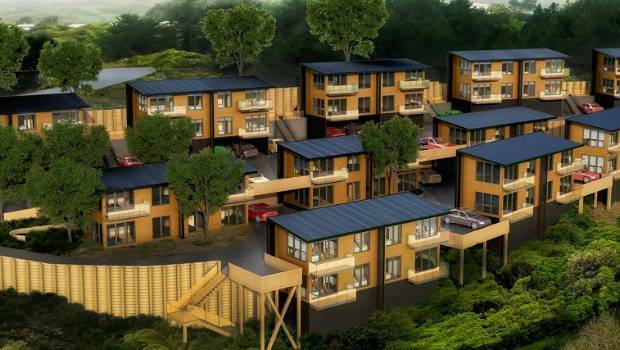 A concept rendering of the finished Tawa development featuring Matrix's prefab houses. 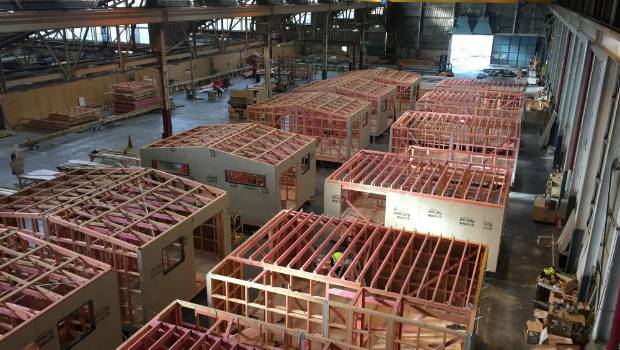 One company that constructs prefabricated houses in New Zealand is Matrix Homes who have an assembly line in the former General Motors plant in Upper Hutt. Account manager Marcus Bokkerink said Matrix was building around 10 houses of various sizes a month. Their output was limited only by the floor space of the factory, of which they were using half, and their number of staff. While the cost of building a prefab was comparable to an on-site build depending on specifications, savings were made on labour costs. A standard three-bedroom house took about six weeks to complete where an on-site build might take a year to 18 months. "You also get to live in your home sooner or [in the case of landlords] get tenants into the house sooner." While Matrix had encountered covenants on subdivisions that excluded "transportable houses" he said Kiwis were coming around to the idea of prefabs as a viable option. Matrix were close to completing a project in Tawa where they would be craning 22 homes on to a new development. Prefabs have come a long way from the cold, ugly school classroom type buildings from an earlier era. Matrix spokeswoman Whitney Murrie said a stigma around prefabs remained from a previous era of buildings such as those commonly used as school classrooms. "Prefabs have come a long way - to the point that they are as good as or better than a traditional build. [The old school classrooms] weren't insulated and had rudimentary fitouts. There was no thought about longevity." Many modern prefabs were architecturally designed and built for livability, she said.